Where's the part where you say how far you run each day? nice review! thanks for posting. I am the same, always looking for the next shoe that is really going to do it for me. 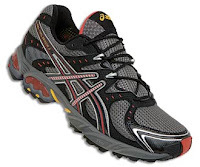 How will these do in snow and cold: ascis gel trail sensor 3 men's? The Sensors do great in the cold and snow. I used them all last winter and ran on (and in) snow most of the time. Of course, no shoe is perfect, and you'll get cold and wet feet sometimes. Thanks for the review. I have been mulling over Asics all day and needed a replacement for my old GT trail. I wanted something a with a longer tread life and a shoe that would survive a puddle or two. Plus I live in CO so I might be running in the snow. If i'm brave enough. Your review sealed the deal. I hope it's everything I wanted it to be. Let me know what you think when you've given them a run through the paces. My local running store doesn't carry the Ascis trail runners, but I love my Gel Nimbus 10's for the road so am thinking of buying these online. How do they compare sizing wise to what I have? Should I try the same size? I haven't compared the 3's with the Numbus 10's. But the 2's and the 9's seemed to be sized the same when I last tried both. Cheers. I'm pondering the Gel-Trail Sensor 4. Have you tried these yet? If so (and if not, then the Sensor 3s), how do you find the cushioning in the forefoot area? I run on the balls of my feet, and absolutely must have very good cushioning under the forefoot (don't use the heels, so heel cushioning is unnecessary). I have not seen any reviews addressing this specific area. Does the protection plate adversely affect forefoot cushioning? If you can spare the time, I would appreciate it if you could shoot me an email (huntnwabbits@yahoo.com). What's your current shoe now that they don't have the gel trail sensor line? Do you know what they replaced it with and if its a good replacement? I loved the structure of the Sensor and have since become a devotee of the La Sportiva Wildcat, a shoe I've come to like even more. Hope that helps.